What happens when you take a psychic and combine them with dreams? This movie! Classy story base with a mix of special effects and some decent acting, but does it entertain? You won't need to go to sleep to find out that answer. Alex Gardner (Dennis Quaid) is a psychic. He's run away after getting his fill of being "poked and prodded" for science, and we run across him as he's having a bit of an altercation after winning numerous horse racing bets. As he flees his pursuers, he is picked up by a mysterious team of guys who take him back to Doctor Paul Novotny (Max von Sydow) who he once worked with (and then ran away from). Here, he finds out that Novotny wants him to participate in his new research - entering people's dreams to see what they see and potentially help them discover or deal with problems that might be hidden in their subconscious. 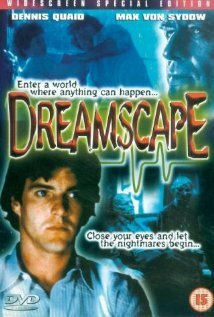 After meeting a young boy who's having terrible nightmares that causes another one of their dream-entering psychics to be sent to the hospital, Alex decides he needs to help the kid and joins the project. It's not all danger-close though. Although a lot of the dream sequences have a distinct level of immediate danger, that's true, but outside of the dreams Alex spends a good deal of time trying to romance Novotny's female scientist helper, and an intricate behind-the-scenes plot dealing with the mysterious Bob Blair (Christopher Plummer) and his motives towards funding this dream research project in the first place. It sets itself up to be the main plot by the end of the movie, with a twist or two along the way that aren't necessarily impossible to see but I imagine could probably surprise some. It's an interesting concept though, being able to jump into another person's dreams, especially to me as a guy who rarely ever remembers what he dreams if he dreams at all to begin with. Nightmares are also a thing that should be familiar to most viewers, and it helps to draw the young boys section closer to the top as far as things that draw you into the movie and investing you into the characters. The dream worlds themselves are handled interestingly enough as well, with damage to one's person not really carrying through (as in, if you are cut you don't wake up cut) although death is still a legitimate option (death in a dream causes a heart attack). It allows danger to exist in the dream world without making it feel too over-dramatic. Actors do a fine job with their roles, even the actor playing the young boy. Considering the subject matter, certain roles (such as the man whose dream reflects his worry that his wife is cheating) come off a bit more comical than others, while some such as the boy come of with a rather serious tone. The characters who are treated as the film's "bad guys" are presented in a manner that, at some point or another, we end up rather not liking them for some reason or another - such as them being jerks. On the other hand, it's possible to also not like our "hero" character Alex all the much either, as he comes off as a bit of a jerk as well - a bit arrogant at times. Sets here are pretty diverse, ranging from the college area (with high tech dream room) to the wide range of dream-worlds. Said dream worlds may include a nuclear apocalypse aftermath, a spooky home and basement, and a normal home with a lot of people hiding in the bedroom. It's a nice use of colors here as well to help make the environment - the spooky home is dark and blue-ish, almost as though it's an olden scary haunted house movie while the apocalypse uses a lot of reds to wash over the destruction. Science items are all fancy technological looking (as one can see in the above wire-laden image of Alex), and thanks to the filtered look of the dream worlds, seems more real and solid. Costumes here are standard fare as far as the physical real world is concerned. When we hit the dream worlds though, that's when the costume department gets to shine - specifically in the boy's nightmare and the post-apocalypse dream. In the boy's dream, we have a wonderful snake creature that terrorizes him through his house that ends up being a mix of claymation style animation with puppetry/costume work for some of the more smooth shots. In the apocalypse dream, we find a mix of mutant people with torn up clothes, monstrous looking dogs with a glow in their eye, and a variation on the snake man from the kid's nightmare. Although it's true that the claymation bit may be a bit dated as they tend to be, the costume work comes off a bit more timeless. No reason to get HISSterical! Overall, I like these kinds of movies, so it's hard for me to not enjoy this one. Understandably, some might find it scary (I mean, I wouldn't think it's that scary a movie, but there are people out there terrified by the laughable Paranormal Activity movies), some might find it exciting. It has a couple of little plot twists in there that really adds to the depth of the plot, adding a hidden focus and driving force up until the final scenes when it comes to light. It's certainly not as intricate or confusing a plot as Inception (another movie dealing with dreams), but it has enough fantastic elements and mystery to keep it entertaining throughout.